We do it every year. In fact, it's been a family tradition since our kids were babies. Check it out. And today we went again. 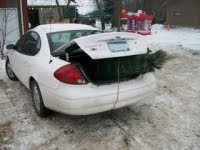 Only instead of stuffing the tree into our trunk like a mafia victim, we chose to use our utility trailer so our new Christmas tree could ride home in style. And what a tree it was. Short, fat, round - an odd little tree like no other we had captured before. More like a Christmas bush than an actual tree. But with my job in jeopardy, we are on a very tight budget this year, and the place we like to use charges by the foot. So when the kids found this little 5 foot tree straight off the Island of Misfits, we knew we had this year's prize. By the time we had played on the hay bale mountain, poked around the gift shop and had hot chocolate, it was already dark. So we threw the wrapped up tree into the trailer and hit the highway for the 15 mile drive home. But then something went horribly wrong. As soon as we climbed out of the car Roseanna turned toward the trailer and screamed, "Dad... where is the tree?!!!" The only thing I could muster for a response was "Holy sh*t!" Sure enough, it was true. Our tree is gone. And now, somewhere between the tree farm and our house, a bound and gagged dwarf Christmas bush is lying in a ditch on the side of the highway. I know this because I promptly backed out of the driveway and drove the 30 mile round trip in search of the missing spruce. And nowhere along the way did I see a tree in the middle of the road - or any overturned cars or emergency vehicles. And so tomorrow morning as soon as the sun comes up, I'm going to make the journey again when I can actually see into the ditch, and with any luck at all, I'll be bringing home our Christmas. Oh, and yes they'll be an update tomorrow. You can count on it. I HAVE to ask!!! Did you NOT use a bundgie across the tree and NOT anchor it onto the trailor? Or did it simply bounce it's way out of the trailor? I can't believe this happened----I feel really bad for you!!!! It is nowhere around, You even went back to where it was bound, with knots you recalled from scouting's past days, But they were not good enough, for any scoutmaster to praise!. Did you see any PETT vans following you? Ya know, People for the Ethical Treatment of Trees? Those guys are out and about this time of year. Wow, this has the teeth for a new Christmas show....too bad there was already an "Ernest saves Christmas"
Maybe the Grinch stole it. I bet next time you tie it down better. "Experience is a good teacher, but it's a grim teacher." Oh, and it is already strung with lights... I know you are jealous! Good luck in the AM! Actually i think I saw it bouncing past my house. Way to go, Jeff. Is that how you loaded your kids in the car when they were younger? I'm sure the tree is weeping somewhere, having been abandoned as violently as it was cut down. Nice job ruining Christmas for your family. I had to come back and tell you what a scream this is. I've been laughing about it for the last couple hours. I'm really worried about your little hogtied tree. Oh, Jeff. Please save it!!!! Don't fret, I found your tree and will drop it off in your back yard in about three weeks. It probably fell out when you had to drive the family roadster under that semi. mom - No, the tree place said they tied it down. But I AM guilty of not checking. Bad me. bill - Very clever. You always were a pretty good poet. Don't ya know it? idaho dad - Those people are insane. One of them threw red paint on my tree last year! carlae - How about "Ernest loses Christmas"
rick - LOL... Well played my friend. roger - I bought a tree after Christmas once before too. But sometime around mid January it became a terrible fire hazard and I had to throw it out. dan - Damn... that was one HELL of a bounce! kathy - I tried Kathy... I really did. anon - Umm... maybe you should just keep it. Call it my Christmas present to you. avitable - D'oh! I'm not nearly as big of a movie buff as you, so this reference is going over my head. Didn't they do something like that in Cannonball Run or Smokey and the Bandit or some crapass movie like that? Sorry, that's all I got. avitable - Hey, I told you. But still... I bet if you checked they did do that "drive under a semi" thing in one of those Burt Reynolds movies. Or was it Convoy? Damn, now see what you've done? "Don't sigh for me, Sergeant Tina"
The farthest my tree has to travel is from the basement to the living room. At least if I lose it on the way, there's a pretty good chance I'll find it again. maureen - Hey, we have an artificial tree for another room in our house, and I once lost the top of it between the storage room and there. So don't say it can't happen! This is so much like my life, I don't know whether to laugh or cry. You pick a 5' tree to save money, then you lose it, so you burn enough gas looking for it that you could have bought a larger, which probably wouldn't have fallen off because it was heavier. I am LMAO. Sorry.